A watch that many will be familiar with is the Hamilton Grade 992 Railroad pocket watch. It serves as an example of the technically best way to functionally-jewel a manual wind time-only watch to the optimum level. All jewels serve a useful function, all wearing surfaces which would benefit most from being jeweled are done so. Add to that the legendary Hamilton quality of construction and you have a very fine timepiece. 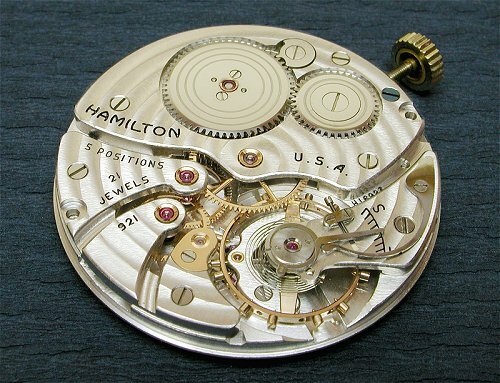 The Hamilton 992 21 jewel Railroad Grade pocket watch movement. …and the Third Wheel, not visible – 2 jewels. Total 21 jewels. 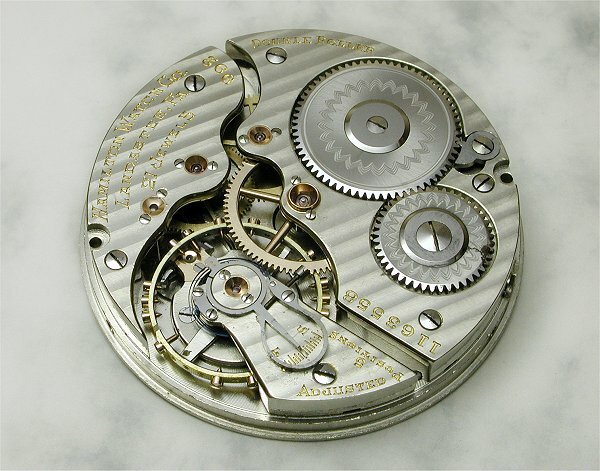 A view of the 992 escapement from the dial side, showing (R to L) the cap jewels of the balance, lever and escape wheel. Now things are getting really interesting. We have seen non-functional and functional jewels. It all seems cut and dried but not so! The area of “useless ” jewelling is a no-man’s land of twisting the truth and stretching the standards. 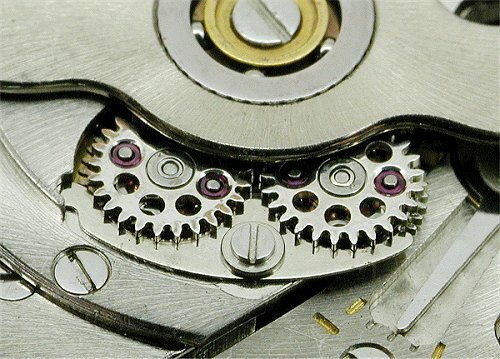 As specific as the ISO standard may be, it falls a long way short of really controlling jewelling, leaving things well and truly in the hands of the watch companies, who, with few exceptions, have succeeded in finding loopholes and breaching the “spirit” of the standard. I define a “useless jewel” as being one which meets the ISO standard to be called a functional jewel, yet does not serve any purpose which significantly enhances the performance or longevity of a watch. Modern watches usually have several, often many. 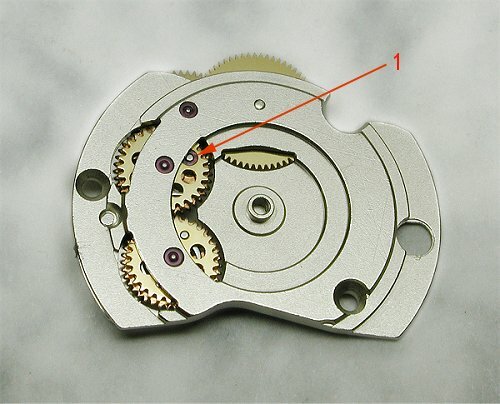 Most, if not all, Eta mechanical watch movements have a percentage of them. Clearly, the sole purpose of these “useless jewels” is simply to legally increase the jewel count so as to make the watch appear to be of higher quality or grade than it is. This practice used to be termed “upjewelling”. Not an engineering solution to an engineering problem, but an engineering solution to a marketing problem. There are so many examples of useless jewels that one doesn’t really know where to start. So, here are a few to give you an idea, from then on it is not too hard to work them out for yourself. 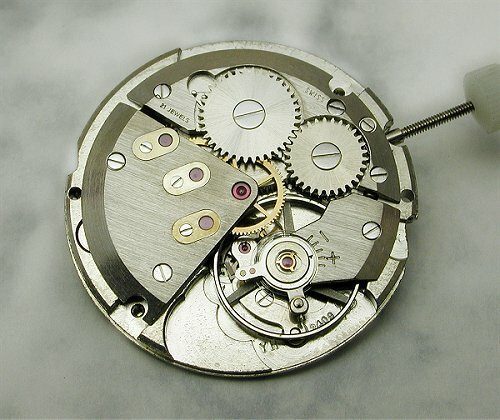 A favorite area for manufacturers to add useless jewels is in automatic winding mechanisms. This is because the parts are relatively large and strong and the manufacturing tolerances far less critical than in the watch train. To round-up the jewel count, often jewels are added to the pawls of the reversers (see “1”). This example is an Eta 2824. The jewel does nothing to alleviate wear, reduce friction or improve the efficiency of the automatic winding mechanism, as most of the wear in this location occurs at the ratchet teeth. What’s more, only 2 of the 4 possible locations received jewels in this version of the movement. Again the Eta 2824. The jewel shown at “2” is at the lower end of the barrel arbor. It functions only during winding the watch, has no function at all in the running train. Traditionally, this location wears very little, even as an un-jeweled bearing. Just an easy place to add a jewel which meets the requirements of the standard. The other end of the barrel arbor, which is more difficult to jewel up, doesn’t get one. Another automatic watch with useless jewels on the reversers. This is an Eterna cal 1412UD, and sports a full complement of 4 jewels in this location. 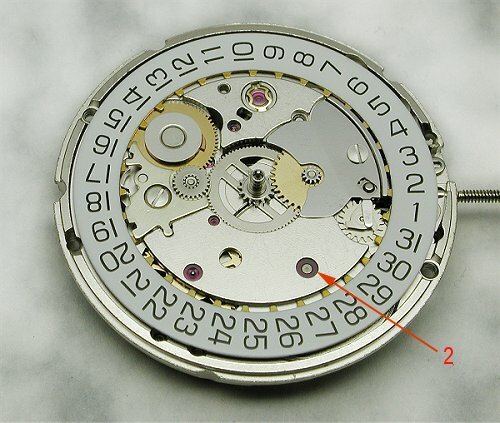 Actually, the Eta 2824 (and others) is based on these Eterna movements. Side by side the similarities are very clear. 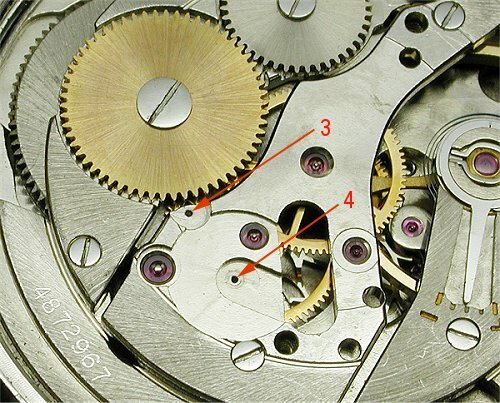 The Eterna movement, this time showing (at “3” and “4”) two pivot holes of the automatic train which would have been better served by jewels, instead of wasting them in the reversers. It is interesting to note that the pivot/hole tolerances used for the jeweled reversers in both the 2824 and Eterna are very sloppy, making it an uncritical area to add jewels. However, to put a jewel where it is really needed and would be of real benefit, say to reduce friction and improve auto winding efficiency, takes more manufacturing precision. 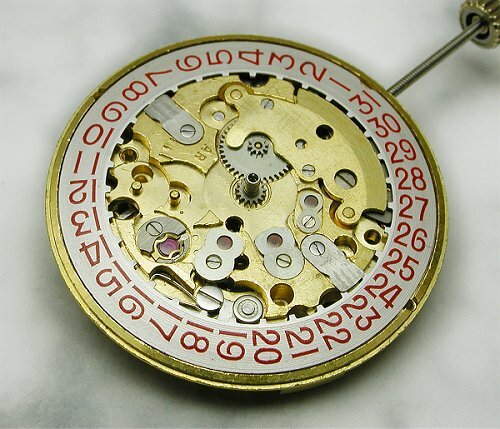 This movement is an Eta 1093, in Enicar “colors”. 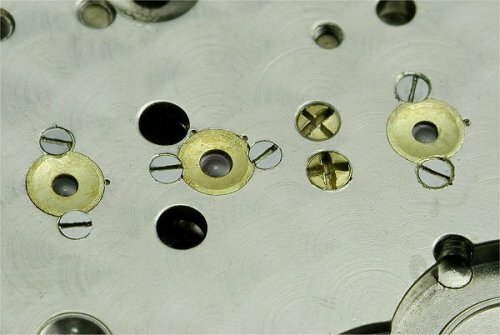 This is a classic example of a cheap way of jewelling a watch movement up to 21 jewels legally, but without actually doing anything useful. It is a long way from a real 21 jeweler like the Hamilton. Here they have plastered cap jewels like band aids over every convenient location, both sides. While these are all technically functional, because the wheel pivots can contact the cap jewels, the ones capping the third wheel, and the lower pallet pivot are virtually pointless. The pallets need to be capped both sides or at least the upper side to do any good. Here we have the dial side of the Eta 1093 above. The – let’s say – workmanlike… method of adding cap jewels can be clearly seen on the dial side of the watch. This watch is an Eta 2409, in 21 jewels, with the same band aid-style way of upping the jewel count as the example above. Admittedly, the escape wheel is capped (I think more by accident than design, as otherwise they would have simply run out of convenient pivots to cap). Once again, the pallets remain uncapped. Capping the pallets, which is technically quite difficult due to the lack of room, is a very good way of helping improve escapement performance in positions – but then again, why bother if the real purpose of adding jewels is for reasons other than improving performance. This example is an Enicar AR1145 (from their “Star Jewels” range. Here two jewels have been used which are worse than useless, yet legally acceptable to the ISO standard. 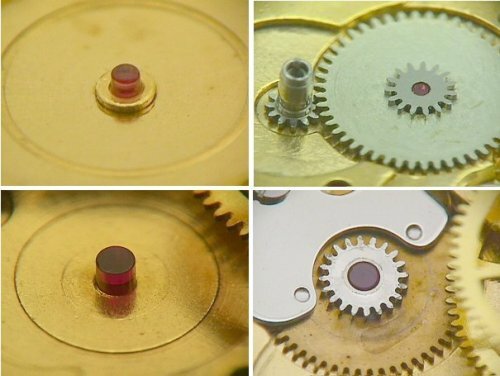 The top two pics show the minute wheel, running on a jewel post. 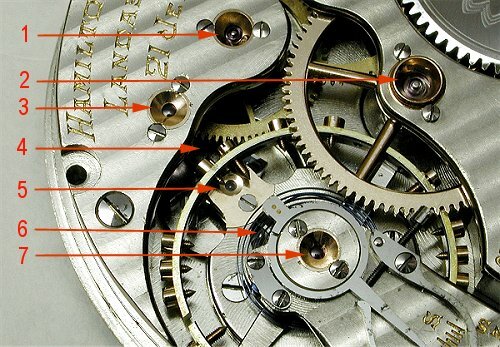 The minute wheel is most likely the lightest loaded, slowest moving, and least critical wheel in a watch – aside from the hour wheel. Actually the ISO standard specifically excludes jeweled hour wheels to be deemed as functionally jeweled, yet allows minute wheels for an unknown reason. The lower two pics show a transmission wheel in the auto winding train. Very slow moving, medium loaded, and being jeweled is not in the least likely to enhance the watch performance, winding efficiency or life of the train. Just two useless jewels, there for reasons one can only assume were non-technical. I hope you have found this brief tour through the minefield of watch jewelling interesting and enlightening. Perhaps you can see now that the jewelling of watches is far less straightforward than it first seems, and simply relying on the word of the watch manufacturer does not guarantee that you really are getting what you think. This applies to both vintage (post 1902) and modern (post 1965) mechanical watches. Having said that, I would add that by and large, American watch companies (at least until they began to use outsourced Swiss movements in the 1950’s) were far less prone to misleading their customers on the matter of jewelling than were the Swiss. They were more likely to omit jewels altogether, for the sake of economy and savings to be passed on to the customer, than use them as a marketing strategy. 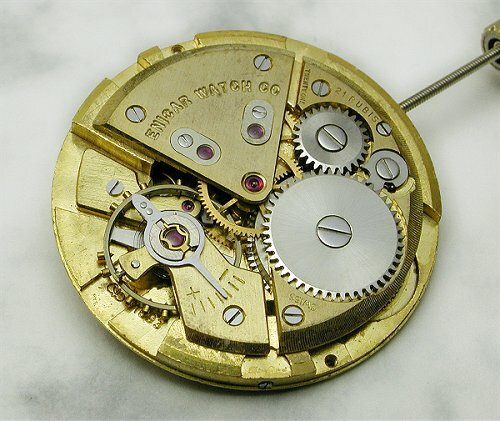 Acknowledgement: I would like to thank Tom Mister of Dashto Horological Services for locating and supplying the Waltham 100 Jewel watch movement. Text copyright © 2002 by Rob Berkavicius (Rob B) Images copyright © 2002 by Paul Delury June 25th 2002, Perth, Western Australia.